Home > Greece > Greek Debt Crisis: Lehman 2.0? As if Greece did not already have enough problems. The market was already jolted by the Goldman SEC case. Then, it was the cloud of volcanic ash from Iceland postponed a key meeting with European Union (EU) and International Monetary Fund (IMF) officials on aid for the country. When the Officials from the EU and IMF finally launched a two-week talk on a Greek rescue package this Wednesday, it failed to calm the bond markets. To make matters even worse, on Thursday, the European Union revised upward its estimate of Greece's 2009 deficit to 13.6% of gross domestic product (GDP) and may be revised to as high as 14.1%. On that news, ratings agency Moody's downgraded Greece's credit rating, the second time in five months. With a string of bad news, a bond market rout eventually pushed two-year Greek government bond yields above 10% and forced 10-year yields near 9% on Thursday. 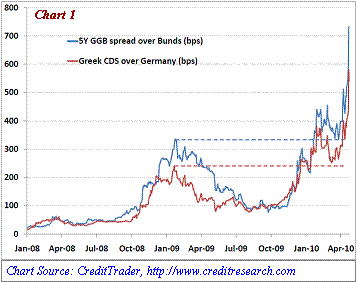 Credit default swaps on Greece’s five-year bonds also surged to a record high of 577 (Chart 1). Meanwhile, the Greek curve remains steeply inverted with two-year yield higher than the 5-year bond, which indicates that the market sees significant near-term risks. At these levels, it is virtually impossible for the debt-strapped nation to meet its funding needs on the open market. This sharp jump in borrowing costs ultimately forced Greek government to formally request the joint EU-IMF rescue plan on Friday. After two months of intense debate among European governments and market speculations, the joint IMF-EU Greek rescue package has finally been decided earlier this month. The size of the rescue package reportedly amounts to about €45bn ($60bn, £40bn), of which less than a third will come from the IMF. The heavily indebted Greece needs to borrow some €54 billion this year and must refinance around €20 billion in April and May. Simple math could tell you this €45-billion bailout only helps avert a temporary liquidity crisis and would sustain Greece through this year at best. 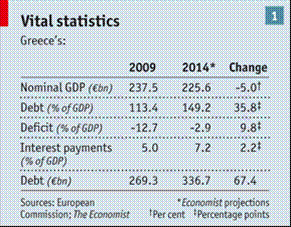 Greece underlying problems--flat growth, high debt load and interest costs--could take years to resolve. Additional rescue program(s) of at least an equivalent sum--or more--might be needed again in the next few years, depending on the progress of their austerity measures. This means resorting to a “debt restructure” to defer loans or pay back less than it owed, could still be a distinct possibility. The proposed spending cuts and revenue raising measures have met with fierce resistance by the public workers. Economists such as Martin Feldstein argue in favor of exchange rate devaluation, hence an exit of the euro zone. A steep devaluation of the currency to improve competitiveness would help achieve a recovery; however, being a member of the euro monetary union, Greece does not have this luxury. Furthermore, currency devaluation, even if feasible, would reduce the country’s buying power costing the country in the long run. Another option - Greece could leave the EU and create a new national currency. The problem is that a potential bank run and the subsequent collapse of the domestic banking system would precede Greece’s exit of the EU, not to mention the chaos ensued converting bonds, etc. from euro into the new currency. "We cannot allow the bankruptcy of a euro member state like Greece to turn into a second Lehman Brothers…Greece's debts are all in euros, but it isn't clear who holds how much of those debts. The consequences of a national bankruptcy would be incalculable." Worries about Greece’s widening deficit and has contributed to a 7.2% slide in the euro this year and sent ominous ripples across a stagnant European economy. The proposed pact would cost EU members--almost all of them facing onerous debts already—additional €30bn ($40bn, £26bn) of debt. More bailouts could be expected with other highly indebted PIIGS nations waiting in the wing. This no doubt will damage the euro's prestige, inevitably increase their debt burden, and further weaken the euro. Eventually, Greece might still default and the entire euro zone will likely face higher interest spread, and so the vicious debt & risk cycle would commence again. Jim O'Neill, head of global economic research at Goldman Sachs, argues that the Greek debt crisis does not really matter very much in the global scheme of things. Nevertheless, the involvement of the IMF essentially shifts the Greece debt burden beyond the EU and to its members. The United States, Japan and the EU are among the top funding nations of IMF’s lending capacity. The Greece crisis has let to increasing scrutiny of sovereign debt, and could be a small-scale sketch of other large nations, including the United States, which carry increasing levels of debt. All this could all end horribly, if governments refuse to cut spending and markets refuse to fund that spending. In the meantime, IMF data shows that China and emerging markets have accumulated $4.8 trillion (£3.1bn) in foreign reserves. 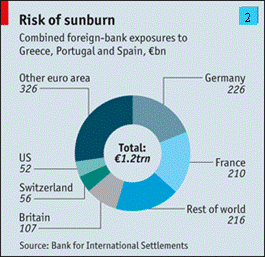 Roughly $1.7 trillion is invested in euro zone bonds. These bond holders with rising powers could play a deciding role on how Europe's drama unfolds. So, before long, we may see new Chinese pagodas sprouting in the Mediterranean when the EU and IMF could no longer bankroll Greece, et. al.